My father was not sure what to do with children, since he had never been allowed to be one. He spent my childhood bemused by me, I think. One of the last stories he told my husband, for the nth time, was how, when I was four, I insisted that he was pronouncing maraschino wrong, and that it was “ma-ra-SKEE-no.” He told my husband that I was a dickens, and my husband assured him I still was. As borne out by the maraschino story, I was quite the handful, not the most docile child in the world. He seems comfortable with four-month-old me in the picture above, but then again I couldn’t talk yet. My grandparents on my father’s side were no role models for how to raise children. They seemed to have no idea of how to relate to children emotionally. My sister remembers our grandfather as a gruff, blustery fellow, and my grandmother was so upset by having a fourth boy, my father, instead of the daughter she wanted, that she ignored him once his sister was born when he was two years old. My father’s stories do not describe warm, fuzzy parents. When I was six, my father was teasing my mother at the breakfast table, telling her how smooth his freshly shaved face was, didn’t she want to feel it? I ran over to him and pressed my cheek to his. He froze as though made of stone. It is only in retrospect that I recognised how odd and sad his reaction is, and how it illuminates how bereft his own childhood must have been of hugs and affection. As we children got older, my father found the role of tutor suited him and made him far more comfortable with us. I delighted in his helping me with my Latin homework, and still have his Latin grammar and dictionary from his college courses. Latin was the warmup to get me to do my math. I never came to like geometry as he did, but with his help, became proficient and even enjoyed trigonometry. My father taught me the love of words, languages, and literature, which eased topics of conversation during my turbulent teenage years. Things became even easier for my father even I became an adult. He found he could talk to me and I found that he could accept it when I told him I loved him and hugged him goodbye after a visit. He looked shocked for a moment, then said that he loved me, too. It became the closing ritual of our weekly phone call. I was lucky to see my father for a few days before he passed away, and although he did not speak to me, he looked straight at me when I told him I loved him. What surprised me, but should not have done, was how many people loved him. I was surrounded by people telling me how he had helped them, many just in normal course of knowing him, but several more through a bereavement group he had unwillingly joined the year before when my mother passed away. When he talked to me, he claimed that he never had anything to say, but the members of the group told me how eloquent he was about my mother and their 69 years of marriage, and how he had helped them with their grief. Most notable was a man who was 18 when he met my father, while dating my sister. He told me that my father changed his life, taking him from someone who didn’t have much of a direction, encouraging him to go to college, find a career, and have a family. The man told me simply, “Your father taught me how to be a man.” I think of my father’s upbringing, and am amazed at the adult who raised some good human beings, made a lot of friends, and helped a lot of people in his life. Not a bad epitaph, and not a bad goal. Happy Father’s Day, Daddy. As my father grew more frail in his last few years, I found myself taking on some of his bucket list so that I could at least share my experiences with him, telling him in person with pictures in hand, if I could, or by writing him. The latter involved pen and paper, as he steadfastly refused to have anything to do with computers. My father grew up in Springfield, Massachusetts, and his childhood memories of the area gave rise to several of his bucket list items. Since I now live only an hour and a half away from his childhood home, his bucket list items tied to this area have become mine. The Berkshires were a favorite topic of my father’s, and familiar to me from story and personal experience. However much my father cherished memories of the Berkshires, revisiting them was not part of his bucket list. The Adirondacks were. I never learned how my father came to yearn for a chance to spend time in the Adirondacks, but he did visit his brother at Rensselaer Polytechnic Institute when he was about ten years old, and may have seen them off in the distance, or traveled through them when he took the train from New Haven to Seattle in 1942 after officer training school. Whatever the genesis, my father always loved mountains. When I was growing up in Atlanta, my family ended up vacationing in Florida, but once we children were older, my father’s preferences were clear. He always drove north when he had time off, to northern Georgia or western North Carolina, drawn to lakes and brooks cradled by mountains. I share that attraction, fostered by trips to state parks when I was the last child at home, staying in lakeside cabins in the crook of a line of ridges. In the summer of 2014, my husband and I planned a small family reunion in the Adirondacks, near Lake George. We had all four kids, two sons-in-law, and most of the seven grandkids all together for the best part of a week. My father was delighted that we had revived his practice of small family get-togethers, and listened attentively to my descriptions of the cabin, the beauty of the wilderness in the mountains, and the trip to the “civilization” of Lake George Village, with its visit to Fort William Henry. Last October, I attended a conference in Lake Placid, in the High Peaks region of the Adirondacks. Driving into Lake Placid, I realized how much my father would have loved the surrounding mountains, the calm lake. Well, he would have loved it in the summertime or in the spectacle of its autumn colors. My father was no friend to snow, so the snow veiling the high peaks would have detracted from his enjoyment of the view, but I know he would have felt he could relax, breathe deeply, and take in the view stretching miles to the distant mountains. Although I was four months too late to tell my dad about this part of the Adirondacks, or to show him any of the pictures, I knew why he had always wanted to see the Adirondacks, as clearly as if we had spoken about it. Although more worn than the Rockies, the mountains shake free of the deciduous trees first, then shake the evergreens off their granite shoulders, reaching respectable heights of three thousand to over five thousand feet. Lakes melted from glacial ice reflect the sky, mountains and trees, witnessing the truth of names like Mirror and Placid, while rivers pound through granite gauntlets, frothing white, throwing mist into rainbows above the water. At night, the stars spread across the sky, glistening in the clear, crisp, air. Villages dot the scenery, small lines of lights delineating the streets, but disappearing quickly in the stony, wooded wilderness that marches to the edges of lakes and roads. It seems impossible that one is in the 21st century, especially when night hides the accoutrements of recent civilization. 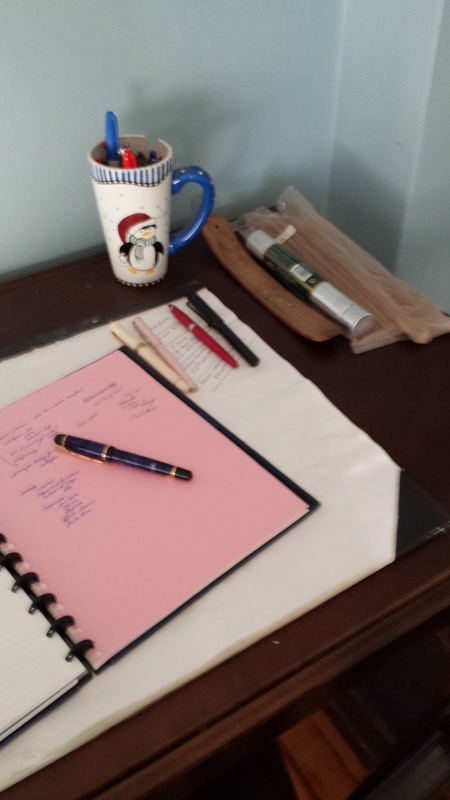 Several months ago, I was tagged in a “Show Your Writing Place,” meme that was circulating around. 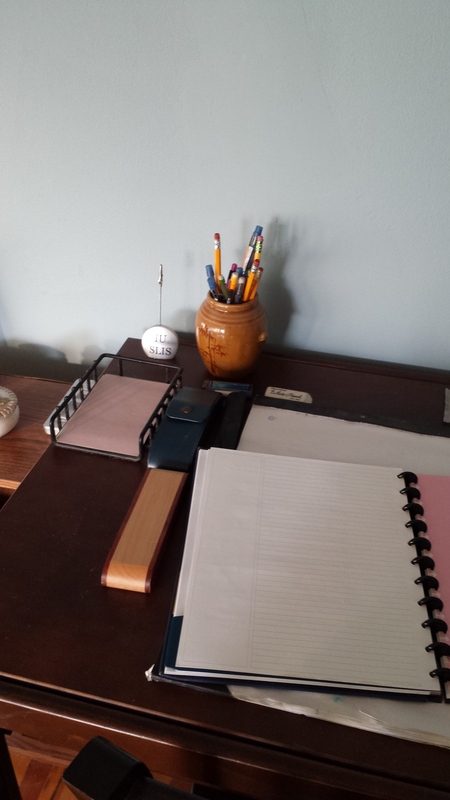 Although my space has been set up for several weeks in my younger son’s room, I haven’t written the post until now. This picture shows the incense I burn in the morning for my meditation before I start working. The penguin cup was a Christmas present from my younger daughter. When it got chipped, I converted it to a marker/pen holder. My fountain pens, with various color inks are waiting for me. I do indulge in colored paper as well, especially when planning or mind mapping, which I am doing here. The left side of the desk has my pencil holder, my cases for my fountain pens so that they can travel from work to home without injury, and a stack of loose paper for reminder notes. Given my ADD, I stick the notes in the clip on top of the little silver holder, plunk it down in the middle of the desk, and hope I see it. It’s not fool-proof, but works most of the time. Despite my recent shift to minimalism, I still have my little ceramic boxes from decades ago, which now corral small, pesky items. 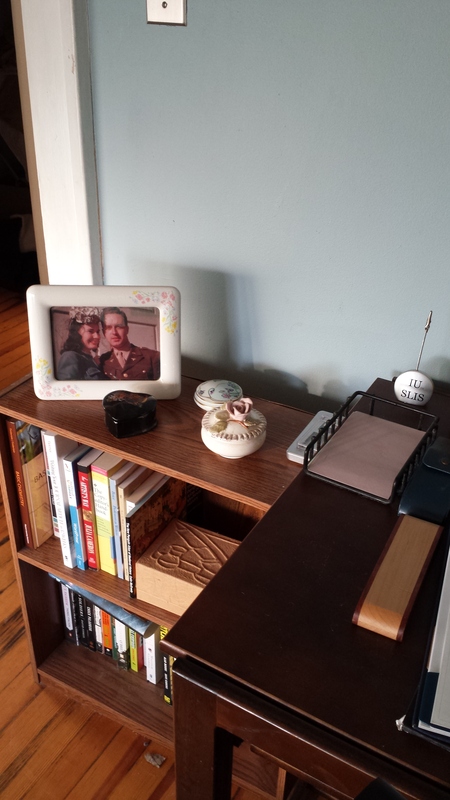 The top shelf also holds my parents’ wedding picture. My mother passed away last April after a long struggle with Alzheimer’s. I like to see my parents in a much happier time. My phone and bluetooth speaker are missing from this picture, but I find music essential for writing. The middle shelf has some of my craft books and a box of fountain pen ink. The bottom shelf holds my younger son’s books, since it is still his room when he come home on school breaks. What does your writing space look like? Do you have objects nearby for inspiration or solace? I’d love to see, if you are willing to share. 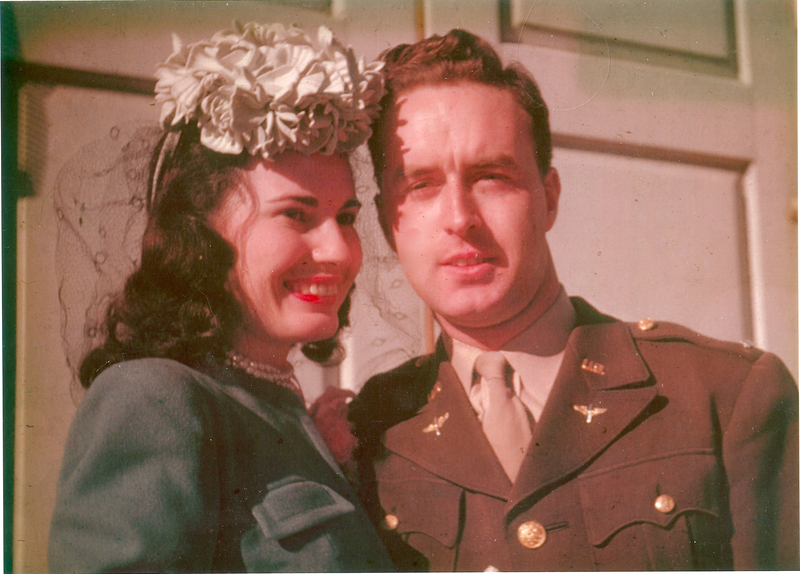 I treasure this picture of my parents’ wedding in December 1945. My father was the first in my immediate family to serve in the military, followed by my brother, my nephew, and my nephew’s wife. My husband’s family has served as well, including his brother, his nephew, and his grandniece. I thank these members of my family, but I also thank all the veterans, past and present. Yesterday, I wrote a gratitude post, to which this is a companion. My aunt was an early positive influence in my life, when so much around me was negativity and despair. I still miss her, although she passed away over twenty years ago. She was the salt of the earth, as some describe that sort of honest, grounded, but very giving person. She helped to bring me out of my snobbishness about education, showing me that common sense and a good heart were often more important in navigating daily life. I thought of her as a grandmother, although in many ways, she was more a mother to me than my own mother. She taught me various kinds of needlework, wheedling the “fairy child” out of her hiding place to bask in her attention. I didn’t realize at the time, but she loved me, and in so doing, countered much of the negativity I felt about myself. Although my mother still lives, she is absent from me. Her lifelong depression, which made her distant from me when I was small, has been subsumed into the raging bitterness that rules her now that she is in severe dementia. I regret that I didn’t listen more to her lessons on gardening, botanical names, and the occasional herbal remedy she remembered from her grandmother. That part of her brain, which she shared with me far too seldom when I was a child, is locked away. It is there in the frail, wasted body burning with anger, only speaking when there are words formed as weapons to shred the last remaining positive memories I have of her, but I can no longer find the path to it. Despite present reality, I treasure the knowledge I gained from my mother, the fragile bridge that she managed to forge with me through her depression to pass on something of value to her. When I was about four, she gave me my own small garden, where I insisted I plant a piece of rosebush accidentally torn from a wild rose. My mother doubted that it would survive, but she helped me prepare the ground and watched me thrust the rosebush into the dirt, watering and watching. Despite the odds, that rosebush flourished, growing over ten feet up the side of a nearby tree, festooned with wild roses every summer. I feel a kinship with that rose, and I appreciate my mother letting me try, even while she was convinced I would fail. Thanksgiving is a time to cherish those around us, but also to remember those who had an impact on us, in many ways making us who we are. Who are you thankful for, and why? Thanksgiving is a time I try to express my gratitude for my family, friends, and life. I was struck by Kristen Lamb’s gratitude post because she concentrates on the blessings revealed by inconveniences. One example, among many, is to see the blessing in washing the dog blankets because she has a dog for a companion. Once I learned how to look at several incidents this fall, I see they are unseen blessings. I am grateful for the post-surgical complication that landed me in the ICU, because I no longer take a day, or an hour, or even a minute, for granted. I am grateful for only having the use of one hand, because I know that it is temporary, and it has made me far more mindful of the things that I do. I often write by hand, with a fountain pen in a notebook, enjoying the process of translating the words to the motion of my hand. I am grateful for the inflated grocery bill, because my sons are home with us this fall, before going to college in the spring. I treasure their stopping here on the cusp of their adulthood. I am grateful for my husband who needs so much more “together” time than I do, because he thinks I am pretty cool, even though especially because I am nerdy. I am grateful for my sister who cannot figure out the time difference with New York and calls in the middle of dinner, because she calls and cares. I am grateful for my friends, who dig me out of my hermit self, and make me do things with them that I enjoy, but would never do alone. I am grateful for my dog who digs up the yard, because she knows when I am sad or feeling ill, and will not leave my side. Thank you to all of you. I am grateful to know you, have you as friends and family, and spend time with you. All my life, I have despised the common saying, “Sticks and stones may break my bones, but words will never hurt me.” I have always revised the second clause to “but words may break my spirit.” While I try not to let what people say hurt me, I am not always completely successful. I often work my way through the hurt, but that is not the same. Tia Bach wrote this thoughtful post about how people will say anything. She mentioned several hurtful things said about her eldest daughter; it made me so angry to read her post. I know how sensitive preteen girls can be. When I turned 13, I transformed from a skinny, petite little girl to a “plump” teenager. Suddenly, I was no longer being called a cute little thing, but “large-boned,” which I am not, or just “large.” I did not deal well with these comments, tumbling into anorexia nervosa. Being painfully thin only changed the comments, so that now I was “gawky,” or”skeletal,” but not the hurt. I often joke now about being many pounds overweight, saying I recovered too well from anorexia, but in all honesty, I have not recovered. I am still far too susceptible to what is said about me.